What a wonderful gift! I really like the painting. Oh that is so cute. Love it. Meaningful gifts....um....um....well, a gift. Not lately. What a good photo of the painting, I have trouble taking photos of them. 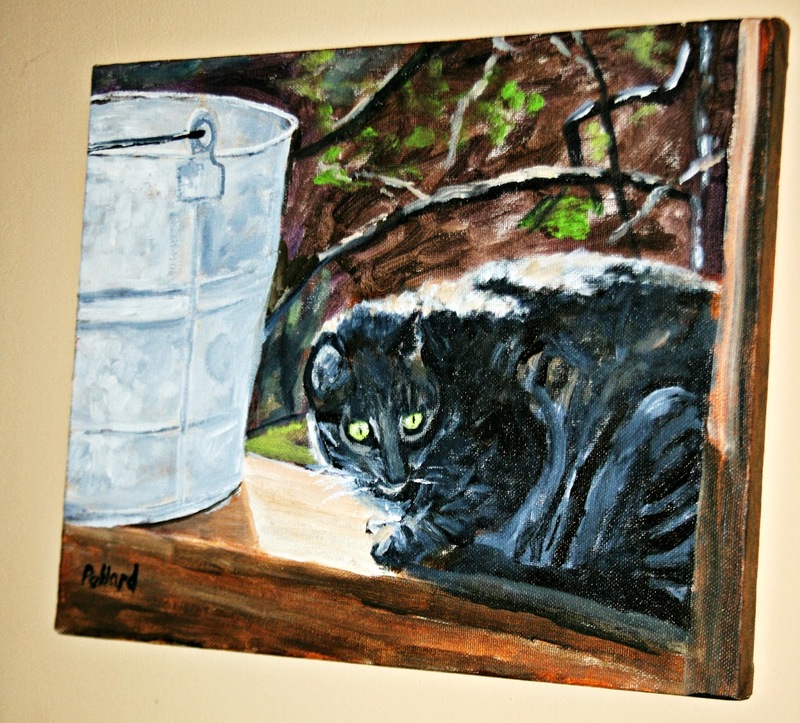 I haven't painted in awhile and was motivated to paint Willie because it was a good photo, I liked the bucket and wood, you need 3 points of interest so those with Willie worked out. I also wanted to do something for you because of all the work that you have done to rescue the horses near you and I don't really have any money to donate so I hope that this painting will remind you for years that people appreciate all of your efforts. - More snow coming can you believe it! Many years ago the band on my engagement ring broke so badly that it was beyond repair. This Christmas the Great Scot gave me a wonderful eternity band with peridot stones (my birthstone). That alone made it special but what made it even more thoughtful was the fact that I'd never, not once, even mentioned wanting another ring, let alone that type of ring...but it was exactly what I would have chosen. What a grand painting, and a thoughtful gift! The folks at Sunnybrook are kindred spirits, from what I can tell. We follow some of the same blogs, etc, though we have never met. What a great gift - beautiful work! What a nice, meaningful gift! A few months back, I had posted a picture of laundry hanging on my line...and fellow blogger Leenie, from Side Trips asked if she could paint it. She then sent me a color study as a thank you gift. It's framed and hanging in my kitchen! How sweet is that??? That's a thoughtful and beautiful gift. What a thoughtful gift, something you'll always enjoy...he has a natural way with color! How thoughtful! Beautiful green eyes. Nice painting. I can see why you admire his work so much. A very very beautiful painting! This was such a thoughtful gift! How nice of your friend, and the painting is lovely. What a terrific gift! Love it! What a fabulous gift... How sweet of him to paint Willie for you... That makes Willie even more special... SO NEAT.... Congrats on receiving this painting. That's a nice painting. I can't draw or paint but I admire the talent of those who can. Oh how i love this picture of Willie!!! What a sweet gift. That is such a beautiful painting! My son just recently gave me a locket with my grandsons photo in it.